Air Force Capt. 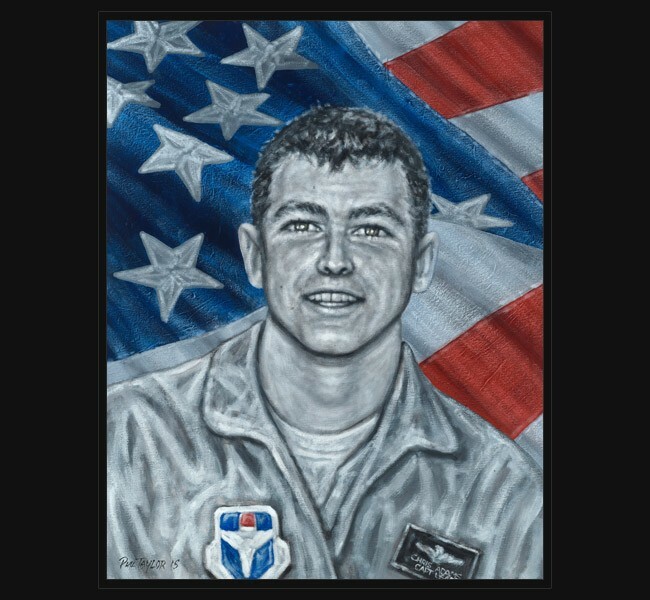 Christopher Adams died June 25, 1996 when a bomb attached to a fuel truck exploded outside the Khobar Towers housing complex in Dhahran, Saudi Arabia. This attack took the lives of 19 Airmen, including four other Rescue Airmen from the 71st Rescue Squadron; Capt. Leland T. Haun, Master Sgt. Michael G. Heiser, Staff Sgt. Kevin J. Johnson, and Airman First Class Justin R. Wood. Christopher and his tightly knit family, including four younger brothers and two sisters, grew up and played hockey in front of their brick ranch house near the Southern State Parkway in Massapequa, Long Island. When their father passed away in 1977, his brother John stated, “Chris took the role of father and kept us in line…He was the backbone of the family, and a source of strength we all looked to.” At Farmingdale High School, Chris excelled as a student, an athlete, and a leader becoming the Vice President of his class. After High School, Chris attended Daniel Webster College, an aviation school in Nashua, New Hampshire, where he joined the R.O.T.C. Upon graduation he joined the Air Force in 1989, fulfilling his childhood dreams of becoming a pilot. While stationed in England, Chris met his best friend and fiancé Capt. Caren Ouellette, where they became engaged and were planning to be married in October 1996. A few weeks prior to his death, Caren bought him a 38-foot cabin cruiser that he called the “Diamond Ring”, named after his fiancé. The couple had planned to sail the boat to the Bahamas for their honeymoon. Capt. Adams deployed in support of Operations in Bosnia, Latin America, and the Middle East flying multiple missions under combat conditions. Chris received the Purple Heart amongst numerous other awards during his service in the United States Air Force. Capt. Christopher Adams leaves behind his mother, Catherine; five brothers John, Pat, Michael, Billy, and Daniel; two sisters Mary and Elizabeth. Capt. Christopher Adams was 30 years old from Massapequa, N.Y. Original portrait was presented November 9, 2015 to Chris’ mother, seven siblings and many extended family members during a special event in Nashville, TN, and hosted by Sanofi.